166. 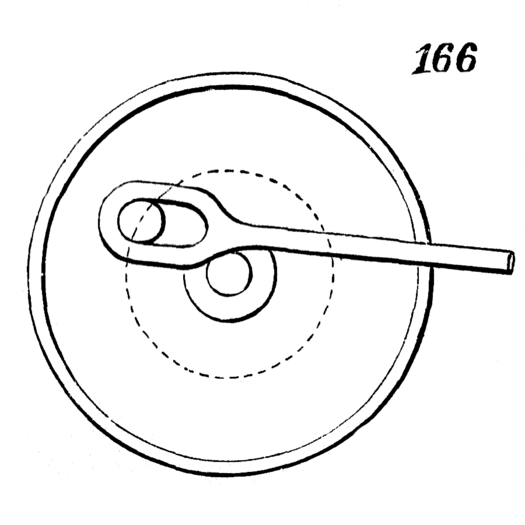 The rotation of the disk carrying the crank pin gives a to-and-fro motion to the connecting-rod, and the slot allows the rod to remain at rest at the termination of each stroke; it has been used in a brick-press, in which the connecting-rod draws a mold backward and forward, and permits it to rest at the termination of each stroke, that the clay may be deposited in it and the brick extracted. This is a type of “lost motion” mechanism. We have added the slide to more clearly illustrate this function.